Join the Discussion Group! We invite you to share your comments, insights and questions on the History of Physical Culture. Hi Tom, Thor really deserved the win. Historically his overhead work and deadlift were weak compared to the other top ranked, but he went to work and brought them up to speed. Recently he has been powerlifting and doing quite well at that too. For a man of his height and arm length he is amazing as is Shaw. Both men have the height and the frame to carry so much weight but dear old Eddie has had to force that much weight on him in order to keep up, not healthy at all. He did the right thing after his win and retired.He achieved what he set out to do,nothing more to prove there. I believe he is weighing up his options on what to do next but has been approached to try Pro Wrestling. This is a fantastic log press training video, with Shaw, Oberst, Nick Best and Eddie Hall. Some fantastic banter when Eddie comes in, I was really laughing watching it. Great to see the guys having fun and training hard. 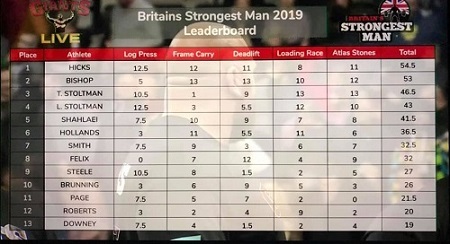 Today Graham Hicks won the 2019 Britain's Strongest Man competition, with Adam Bishop coming in 2nd and Tom Stoltman 3rd. Congratulations to Hixxy! Also of note, Mark Felix retired from further BSM competitions. Photos & results courtesy of Julian Howard. Hi Danny, thanks for this mate,Been off line for a few days so just seeing this. Well Hicks is consistent and this win is well deserved.Congratulations to him.Mark Felix is amazing, no disgrace to finish where he did competing against such a young and strong field. He still has a lot left in him but another level now. 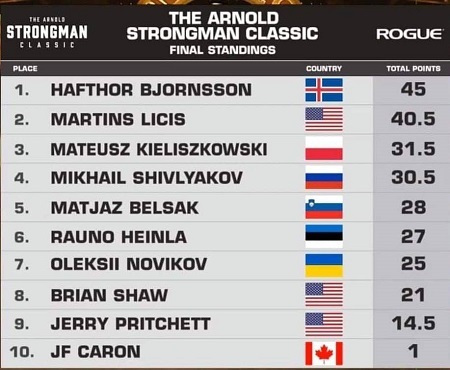 Congratulations to Hafthor Bjornsson on successfully defending his title and winning the 2019 Arnold Strongman Classic! Congratulations as well to Martins Licis & Mateusz Kieliszkowski on their 2nd & 3rd place finishes! I didn't see the competition, so I don't know what circumstances there might've been (if any), but Brian Shaw only placing 8th is a surprising result. I assume JF Caron only having one point is an indication that he had to pull out due to injury or something. EDIT: Apparently Brian Shaw injured a hamstring during the deadlift event. So here's wishing him a full & speedy recovery! Thanks Danny, congratulations to Thor, he has worked hard over the years on his weak points and really is now a very excellent all round strongman.Martins and Mateusz are the new breed and if all goes well their Glory days are yet to come. Sorry to hear about Brian and J.f. and hope they have a quick recovery.Glad you are back to keep us updated on Strongman competition. 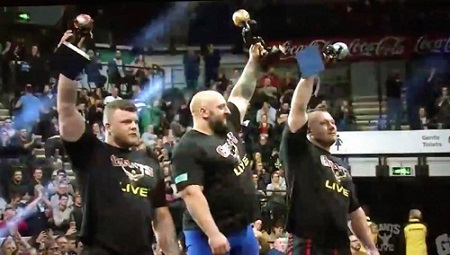 Congratulations to Hafthor Björnsson on winning Europe's Strongest Man 2019 yesterday (his 5th ESM title overall), as well as to Mateusz Kieliszkowski & Konstantine Janashia on their podium finishes at 2nd & 3rd place! Bravo! 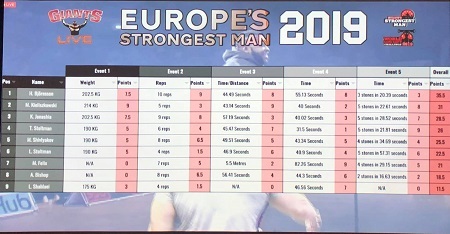 Also happening yesterday, Iron Biby hit a 220kg Log press (the 2nd heaviest after Big Z's world record), Graham Hicks hit a 214kg Log press for a new British record, Rob Kearney hit a 214kg Log press for a new American record, and Mark Felix set a new Hercules Hold world record with a hold of 1min 22secs. Congratulations to all of them! Perhaps the highlight though was an armwrestling match between Vytautas Lalas & Eddie Hall, which Vytautas won. It was just tremendous & amusing, the way Vytautas taunted & toyed with Eddie! With Vytautas having an actual background in armwrestling, poor Eddie never really stood a chance. Congratulations to Vytautas! This video of the armwrestling match isn't very good quality, but it was the best I could find on YouTube at the moment. Hi Danny, thanks for the report mate. Thor is really coming into his own now as one of the best all time Strongman competitors.Looking forward to watching the event. Congratulations to all who placed or made a record.You have got to love Mark Felix for still mixing it up with the young guys and still doing well overall. Congratulations to Oleksii Novikov on the big win!